I am a recovering perfectionist. A few years back, when I worked in the clothing department of a major retail chain, I was one of the slowest zoners. (Zoning is what they called picking things up and making it look good for the store to open the next day.) But my section always looked good. In school, sometimes I had a hard time completing homework and turning it in. I wanted it to be right. “Done and imperfect is better than incomplete and perfect” has been a hard lesson to learn. I find this continuing into my dance practice. I spent a long time striving for “perfection”. The trick is, there’s no such thing in art. There is too much subjectivity that comes into play. I spent many years working on my technique, in pursuit of a more definable gold standard. The result? I’ve got pretty darn good technique. Movements vary quite a bit, depending on your teacher, and I can tweak my movement to match most styles. I can stand onstage and perform any number of stupid human tricks to delight any audience. But stupid human tricks are not art. As an audience member, I know that perfect technique and stupid human tricks will only hold my attention for so long. In fact, technique that is too intricate will find my eyes wandering even sooner because I’m not sure what to look at. My performances were not what I would want to watch because their artistry was lacking. As my technique became more and more “perfect”, my performances grew further and further from that goal. More recently, I’ve been putting my effort into artistry. But there is no gold standard for good artistry. It is much more ephemeral and hard to define, therefore there is no “perfect”. And actually, pursuit of perfection can be more of a hindrance in performance. Trying to appear too polished may leave a veneer that allows the audience to slide right off. It’s the little nicks and grooves of vulnerability that give the audience somewhere to hold on. In my practice, I’ve had to learn to abandon the pursuit of perfection in favor of progress. I’ve had to give up the easily measured in favor of guesswork and feeling things out. This has been a very uncomfortable process. But that is where art lies. To help me in my practice, I’ve commissioned a wall hanging for the wall of my studio. It will serve as a reminder as I continue my pursuit of imperfection. 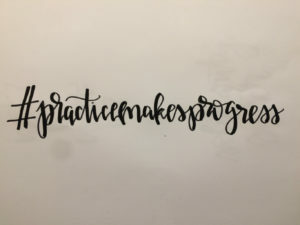 I will remember that practice will not lead me to perfection. Instead, it will lead me down a path of progress.